This meal is a slaughterhouse by-product, it is high in nitrogen as well as many micro nutrients. It is processes into a fine dry powder form, making it easily water soluble and one of the fastest acting organic fertilizers available on the market. The powder form can be mixed with water to make a liquid fertilizer or used dry, and mixed into the soil, along with bone meal and other animal by-products. It is permitted in certified organic production as a soil amendment. Of the three macro-nutrients used by plants, nitrogen, phosphorus and potassium, nitrogen is the one that growing plants need the most of, however fast acting nitrogen sources this are also the ones that are easiest lost through leaching. Often it is better to use a slow release nitrogen source like alfalfa meal or feather meal that aren't lost so quickly. Although dependent on several factors a single application of blood meal can be effective for 6 to 8 weeks. Leafy, nitrogen loving plants, such as lettuce, grow well with this fertilizer but care needs to be taken when applying blood meal, especially younger plants and seedlings as the high nitrogen content will burn your plants roots. Fertilizer from this source is best utilized when your crops are showing signs of nitrogen deficiency and require immediate assistance. One sign of nitrogen deficiency any time throughout the growing season is yellowing of the leaves. Although nitrogen deficiency is not the only reason for yellowing leaves if an application of blood meal returns leaves to a healthy deep green in a short time then your problem is solved. 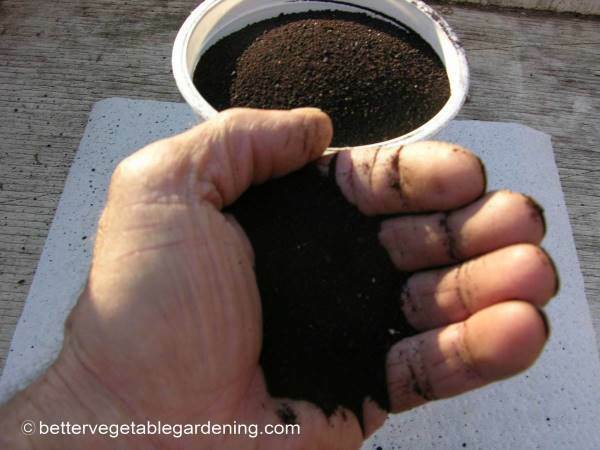 Blood meal is an excellent addition to the compost heap where there is a shortage of green matter to supply the nitrogen necessary for good decomposition. Because it is a quick release nutrient source it is not a good candidate for the long term fertilizer program in the fall as most of it would be long gone by the time it was needed.